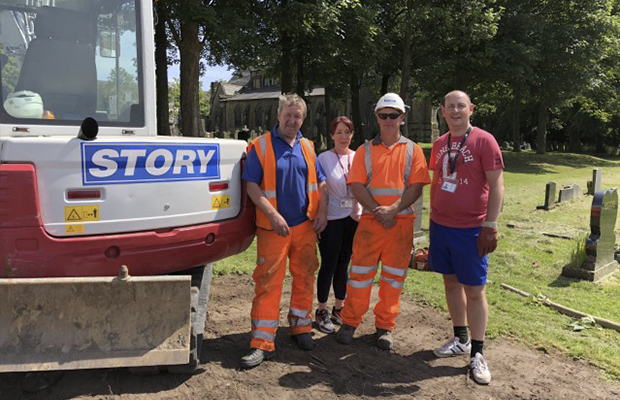 A team from Story Contracting have been helping to spruce up a churchyard near to where they were working on a project in Liverpool. 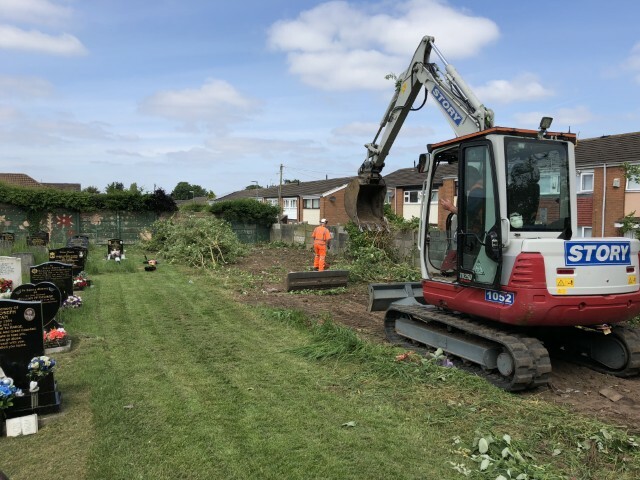 Over two days they helped to clear an overgrown area at St Bartholomew’s Church in the Roby area of Knowsley which will allow burials to take place there again. The team was working to remove a compound previously used by Network Rail adjacent to the church and used soil from the area to help repair parts of the churchyard which had been affected by subsidence. Story Contracting was approached about the project by local councillor Colin Dever. He said: “We wouldn’t have been able to achieve what we did if Story Contracting hadn’t been involved. I can’t emphasise that enough. “The grounds were looking very tired and the graveyard was at full capacity so burials couldn’t take place. This work has helped open up the churchyard for more graves so the local community can be buried near family members once again. “Story Contracting also resurfaced a footpath which had fallen into disrepair. The path links our community with the church and some of our elderly residents had fallen on the path before it was renewed. The team carried out the work on Tuesday, June 5 and Wednesday, June 6 alongside local councillors and members of the community.